Charles F. Reams, founding Partner of Reams & Reams, began his career in personal injury and insurance defense lawyer in 1983, alongside his father, Warren Reams. 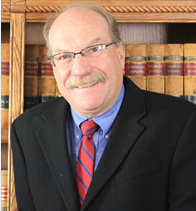 In 1991, Mr. Reams was appointed the position of Public Administrator of the 21st Judicial District of Colorado. He specializes in administration and litigation of decedent’s estates and trusts, protective proceedings including guardianship and conservatorship matters, wrongful death litigation, landlord/tenant, real estate, and general practice. As the Public Administrator of Mesa County, he is repeatedly appointed to combat the growing number of financial exploitation cases in the county and and surrounding Western Slope. Mesa State College, A.A., High Distinction, 1976. University of Colorado, B.A., Distinction, 1978. University of Denver, J.D., 1982. Ongoing relationship with Colorado Legal Services and the Pro Bono Project to host semi-annual Estate Planning seminars at City Hall Charles F. Reams, Auction Contracts and Working with the Public Administrator, Denver, Colorado (Jan. 2010). Charles F. Reams et al., CLE: The Probate Process From Start to Finish, (December 2010). Reams, Charles, “Tribute: Warren Floyd Reams,” 41 Colo. Law. 119 (2012). Hiatt v. Schreiber, 599 F.Supp. 1142 (D.Colo. 1984).